The VIA EITX-3000 is designed for ultra-thin embedded applications and can withstand temperatures ranging from -10°C up to 70°C. The powerful VIA Nano processor and VX800 media system processor are placed on the reverse of the board, allowing greater space saving for passive cooling and entirely fanless embedded designs. The VIA EITX-3000 includes an on-board DC-DC converter which supports both AT and ATX modes, configurable via an on-board switch, supporting a wide range of power input voltage, from DC 7V ~ DC 36V. The multi-display options of the VIA EITX-3000 mean that it's ideally suited for high-end multimedia applications including POS, Kiosk, ATM, HMI, factory automation, POI and digital signage. 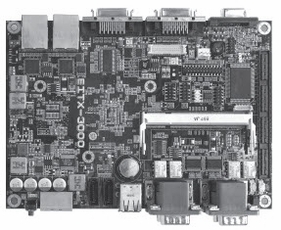 The VIA EITX-3000 board takes advantage of the latest Em-ITX form factor specification from VIA, adding longer dual I/O coastlines to provide space for an array of I/O options including dual LVDS ports, a VGA port, dual Gigabit Ethernet ports, 6 USB 2.0 ports and four COM ports consisting of two BIOS configurable RS-232/422/485 serial ports, and two RS-232 serial ports.